I have just got back from the most amazing trip to Marrakech! Expect a detailed blog post about it soon… the country is so beautiful I managed to get lots of great content whilst I was there and can’t wait to share with you all about it! They are right on trend with the perspex heel and long laces, as well as being really comfy and easy to walk in. 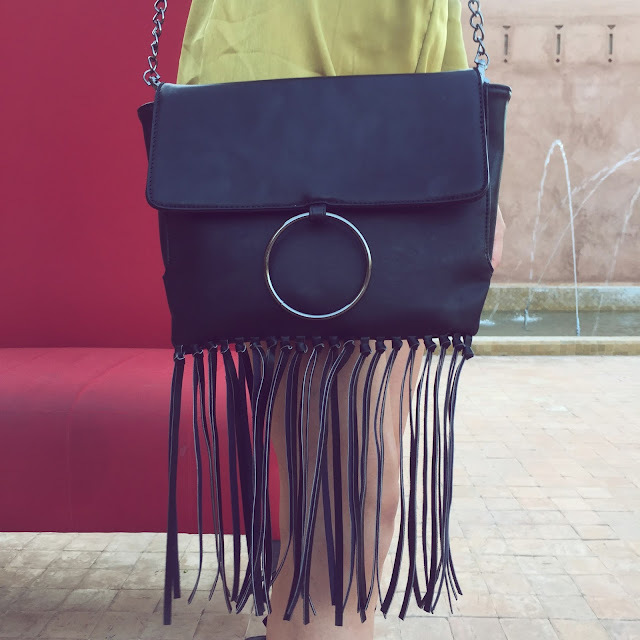 This is my new favourite bag – I love the similarity it has with the ever so popular Chloe bags and the fringe details sets it aside from your standard black shoulder bag. I am like a magpie when it comes to all things shiny! Any satin or silk material I instantly fall in love with. My playsuit in this post is from Pretty Little Thing and was a great holiday piece. The olive colour is lovely and looks great with a tan. Unfortunately for me this was taken at the beginning of the holiday so I am still a little pale haha. Wow what a beautiful romper. Love the bright color. And the cool shoes!